Have you ever looked out over your garden at dusk and seen a fast-moving shadow? If you’re lucky, that’s a bat eating mosquitoes and other pesky insects. 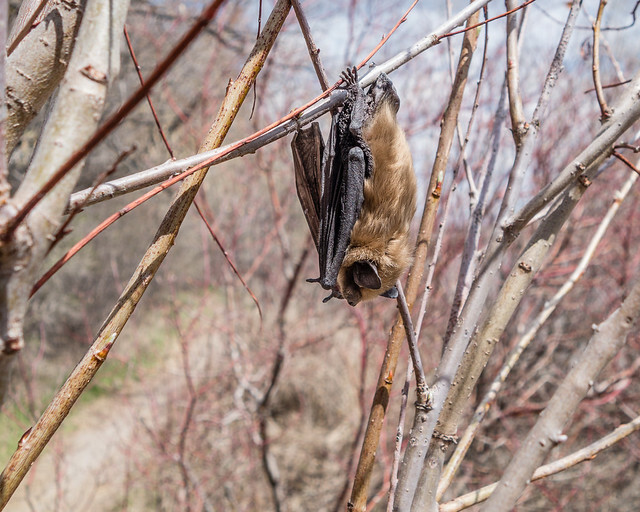 There are 8 different kinds of bats in Saskatchewan and they all eat insects – up to 1,000 an hour! Bats are the only mammal that can fly (humans try, but we have to rely on airplanes and paraglider wings!) and they fly really, really well. Imagine shouting out loud as you walk around your house in the dark. You’ll hear an echo as you approach a wall – but will you figure it out in time to avoid bumping into the wall? Now imagine you’re tracking a tiny flying insect – bats are such experts that they can tell exactly what is in front of them, decide whether it’s good to eat, and plan a route to intercept the bug in just fractions of a second. Bats can fly faster and with a wider range of movement than birds. Their wings are a thin, flexible membrane stretched between elongated “fingers” that can bend in all directions. Bird wings are thicker and have a more rigid bone structure. A baby bat weighs up to 25% of its mother’s body weight when it’s born. That’s like a human mother giving birth to a 14 kg baby. Many bats set up cooperative nurseries where 20-300 mothers raise their young together – with no help from the males. In some maternity colonies, the mothers will nurse other mothers’ babies. The babies are born blind and without fur but grow quickly and can fly within 4-6 weeks. Bats hang upside down by their toes to sleep, making it easy for them to take flight rapidly. 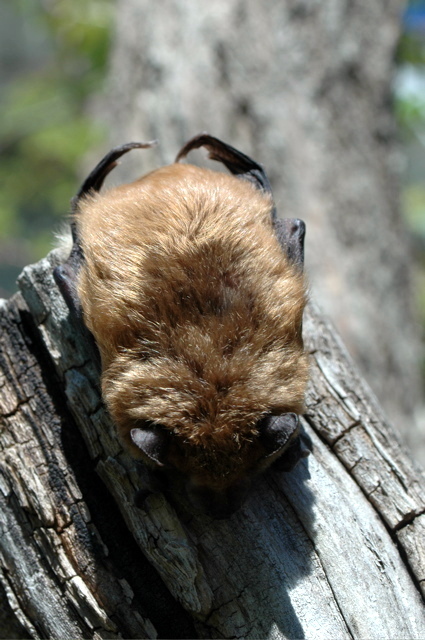 Red Bats hibernate over winter in trees or under leaf litter, using their thickly-furred tail as a blanket to keep them warm. Little Brown Bats hibernate in caves or abandoned mines. Hoary Bats raise their young in Canada and the northern United States but spend the winter in the southern United States or Mexico. Big Brown Bats, often seen in cities as they like to roost in buildings, fly very fast and can reach speeds of up to 40 miles per hour. They have such strong jaws that they can eat hard-shelled beetles. Bats are cute. They have pixie ears and soft fur. Red Bats are showy with fur ranging from bright orange to rusty brown. Hoary Bats have dark brown fur with white tips – a useful camouflage as they roost in trees and blend in well with the lichen and dead leaves. Even if you like bats, you may not want to share your house with them. They don’t chew things like rodents, but they do make a lot of noise and they’re not toilet trained (although the bat poop makes great garden fertilizer and doesn’t carry diseases). Bats start to come out of hibernation when there are big changes in temperature – really cold at night but above zero in the afternoon. However, it’s still way too cold for them to survive outdoors full-time and there are no insects for them to eat. If you spot a bat in your garage or attic in early spring, don’t shoo them outside as they’ll just die. The same thing applies if you come across bats holed up ready for the winter when you’re renovating in the fall. Ask for help. Call the Wildlife Rehabilitation Society of Saskatchewan’s hotline at 306-242-7177 from 9 am to 9 pm. Wildlife rehab. experts are on hand who will rehouse and over-winter your bats. Melanie Elliott in Saskatoon currently has 100 bats hibernating in Rubbermaid file boxes in her basement. She segregates the males from the females as the females tend to sleep very soundly over the winter whereas the males are more active. The bats like an enclosed space and will tuck themselves up near the drape covering the box. Megan Lawrence of Salthaven West Rehabilitation Centre in Regina is over-wintering 20 bats this year. She doesn’t have a cold space where they can hibernate, so they’re awake and active in soft-sided enclosures that are big enough for them to stretch their wings and fly a little. They have access to food (mealworms) and water as well as safe spaces like knitted “caves” and roosting pouches. Once the weather has warmed up sufficiently and there are lots of insects for them to eat, Melanie and Megan will release the bats where they were found. Would You Like to Meet a Bat? Batrick and Elizabat are two Big Brown Bats that Melanie Elliott was unable to release due to injuries. She obtained a permit from Saskatchewan Environment to keep them for educational purposes. They live in her home and accompany her when she meets with school or community groups to talk about bats. If you would like to invite Melanie, Batrick, and Elizabat to visit your classroom or community group, call Melanie at 306-227-2506. Funds raised will be donated to Living Sky Wildlife Rehabilitation in Saskatoon.